The board has a compact form factor of 38X52mm and is an excellent solution for developing projects based on ATmega2560. 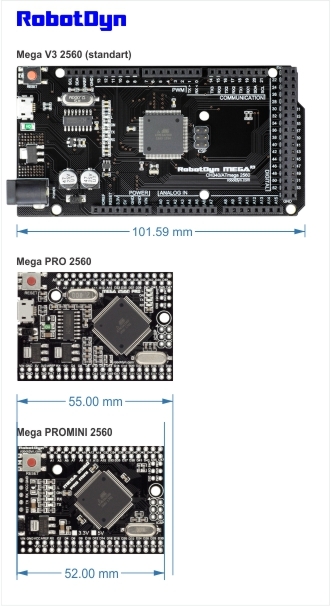 The Mega Pro Mini functionalities are identical to the Arduino Mega 2560. Even though it is an Embed board, it is solid stable as the Mega Board. It uses the original chip, and a 16 MHz high-quality quartz resonators is present on the board. The board doesn’t have a USB interface. In order to connect Pro MINI to a PC you have to use USB-TTL converter. The board can be powered through the power PIN Vin). The maximum output current upon 5V is around 800mA, while on the 3.3V it is about 800mA. In the picture below, you can see the difference in size between the MINI and the usual Mega.